One of the biggest tech trends to follow is the evolution of 3D printing -- not just in the consumer market, but also in education. In fact, last month, the NMC Horizon report predicted that 3D printers will be seen in schools in the next five years, as students and teachers experiment with creating real objects out of plastic and other materials. Why would a teacher or parent be interested in purchasing a 3D printer? To print out a life-sized heart that can be disassembled piece-by-piece and examined closely; to print out one-of-a-kind LEGO pieces that can be used in custom models; to create your own cookie cutter molds. In essence, to leverage the benefits of spatial learning, or thinking in 3D. Most 3D printers can be purchased pre-assembled (or Out-of-the-Box) – simply unpack it, connect it to a computer, install the software, and it’s ready to go. The other solution is a 3D printer kit that must be assembled by the buyer. Some prefer this solution because it's cheaper (kits are usually $100 or more less than a pre-built unit) but also in order to learn how everything works. There’s often no better way to know how to repair something than by initially putting it together and knowing what goes where and how all the parts work together. But once you’ve got a 3D printer built and connected to a computer, the next step is to begin brainstorming and designing an object -- and for that you'll need Computer Aided Design (CAD) software. CAD software has been around for decades. The program displays on your computer’s screen different perspectives of an object so you see it from every angle. CAD allows a skilled creator to “draw” something from scratch on the computer screen, designing any kind of object. Talented CAD designers can create just about anything using this software – a motor for a concept car, a new toy water blaster, and even replacement body parts. TinkerCad.com doesn’t even require a software installation, and runs directly from a web browser like Chrome or Firefox. TinkerCad has built-in tutorials that will help a user gain the basics of dragging shapes, adding letters, resizing objects, and much more. It’s colorful, very friendly to the youngest of students, and completely free to use. Kids can design an object and save it, returning later to fine-tune and tweak it as needed. After designing an object on TinkerCad, connect a 3D printer, and then print that object out. 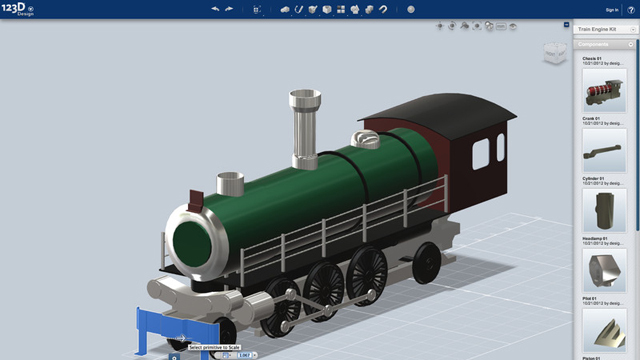 With 3DTin.com, not only can students create their own designs, but they can load existing objects (called models) that have been created by other users and then modify them. 3DTin offers tutorials as well, so novices can quickly gain proficiency. As with TinkerCad, most models can easily be printed to a connected 3D printer. One of the big names in the CAD application industry is AutoDesk. While much of AutoDesk’s professional-level products are only available for purchase, the company has created a number of free CAD applications that can be used with 3D printers. 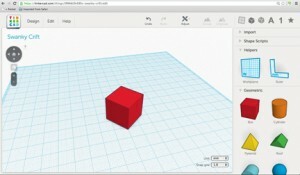 AutoDesk offers 123D Design to users as a fast and easy tool for creating 3D objects that can be immediately sent to a connected 3D printer. But don’t ignore the company's other free apps. 123D Creature and 123D Sculpt are two iPad apps that let users create custom objects on an iPad that can be saved and printed. 123D Catch lets users take a number of photographs of an object (from various angles) and then converts it to a 3D model that can be tweaked and then printed. Finally, 123D Make can take a model and slice it into layers that can be cut out in wood, plastic, or cardboard and then assembled. Printing real objects with a 3D printer is fun, but don’t discount the real-world skills that students will acquire and that will benefit them later in school (and in life). Math requirements can run the range from simple multiplication to trigonometry to calculus -- imagine students needing to understand how to calculate area between a curve and a straight surface for printing out an object to hold a liquid, for example. 3D printers are only going to get cheaper, easier to use, and more precise in what they produce. And whether or not students show an interest in art or engineering or any other discipline, they'll need some kind of understanding of CAD so they can put the technology to use in the careers of the future.